Tournaments with a PokerStars’s Spin ‘n’ Go format are popular more than ever. Just remember, when they appeared years ago, how much negative comments they caused. Today almost every bigger poker network has its own variant of Spin ‘n’ Goes. It seems to be very attractive for both recreational and professional players. YourPokerCash brings you Top 3 poker rooms for this kind of game. The first on our list is Sit & Go Jackpot tournaments by partypoker. Not just a great traffic and a lot of action, there are also plenty of side promotions that are making partypoker the best choice. If you log in to your partypoker lobby and click the Sit & Go hero card, you will find tournaments which are based on the jackpot sit-n-go concept in which the prize pool is randomly assigned shortly before the first hole cards are dealt. Tournaments can multiply the initial buy-in by 2x, 4x, 6x, 10x, 25x, 120x, 240x or incredible 12.000x. Featuring buy-ins from just $0.25 up to $250, with a max multiplier of 12,000 that could win a whopping $1,000,000+ for first place! Check the full breakdown by limits here. The other very interesting thing is that partypoker pushes a lot of promotions through these tournaments. Often you can get free tournament tickets if you play enough games. Almost always there are tournaments which biggest prize is the buy-in for some of the great series which are constantly running on this poker room. At this moment, if you play $10 Sit & Go Jackpots, you could get a MILLIONS ONLINE seat. If you win the tournament with exactly that ticket, you will get $2.5 million on top of first prize. Not only you can win tickets for the online events, but you can fight for some great live packages. Right now, in the lobby, you can find $10 tournaments where you can win CPP Bahamas Package. This is maybe the most underestimated offer in the online poker world! 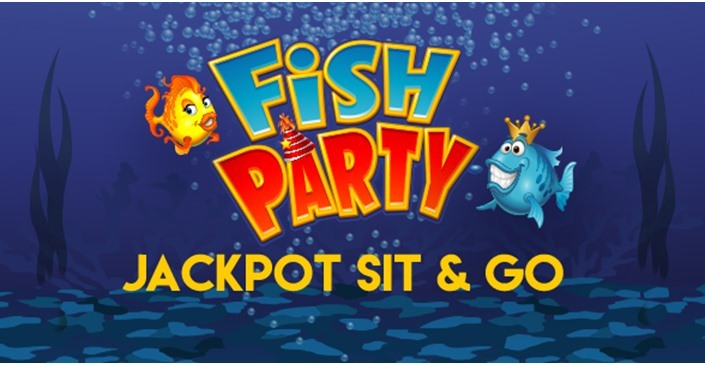 The Fish Party Sit & Go tournaments have two big advantages unlike other Spin & Go variants of other online poker providers. First, you pay only 6% rake here at all buy-ins and not up to 8% like at other poker providers and you have the chance to win a very big jackpot, which is much higher than the maximum payouts of the others providers. These are the main reason we put it to the 2nd place. Especially because of the numerous fish party promotions and the jackpots which, of course, attracts a lot of players to the tables and you will actually find almost 16h a day good action. At the higher buy-ins, starting at 20€ the traffic is at the moment not so good and depends on the time it takes maybe around 1min until a table open. At this moment, there is the Fish Party Challenge running. There are three leaderboards based on the buy-ins, and they will run for two weeks at a time. After each two-week cycle, the boards reset, the players who made it to the leaderboard will get their tickets and the next challenge begins. And of course, you can compete in all leaderboards. So, all you need to do is just to play your favorite fish party games and you will get great-value prizes. This is not all! If you sing up with us to one of the Microgaming’s skins we are offering, you will get Elite VIP status for life which means 30% of cash back at any time. Also, you will get a First Deposit Bonus which is worth 20% of cashback. Choose between the Betsson Poker, Nordicbet Poker or Betsafe poker to start your Fish Party journey! For the 3rd offer, we chose iPoker’s Twister tournaments. The main reasons are good cashback deals you can find on various skins of this network, and side promotions which are constantly running. Twister Poker tournaments kick off after three players are registered. At this point, the prize pool is randomly determined to be between double and 1,000-times the buy-in. The games take place in hyper-turbo format and are typically softer than at other sites due to the amount of casino and sports wagering players looking for a punt and not knowing good push-fold strategy. There is a lot of action and a lot of side promotions. The most popular promotion for these games is Weekly Twister Race. The weekly Twister Races run from Mondays at 12 a.m. GMT through Sundays at 11:59 p.m. GMT and award the top 250 spots. You earn the same leaderboard points as the buy-in and double that if you win it. The higher the stakes you play and the more games you grind, the better your chances to be high on the leaderboard. We offer you Betfair Poker, Coral Poker, William Hill Poker or Titan Poker to start your Twister Race. The full review of these offers with many other promotions you can check on our site. We hope you like our Top 3 poker rooms for Spin ‘n’ Go format games. Next week we will write about great poker rooms for MTT tournaments.